"I think it must be terrible to hate as many things as Mr. [Westbrook] Pegler hates, and I would be unhappy I think and therefore I'm afraid that he's unhappy and I'm sorry for him because after all we all grow older and we all have to live with ourselves and I think that must sometimes be difficult for Mr. Pegler." --Eleanor Roosevelt to Mike Wallace, Nov. 23, 1957, "The Mike Wallace Interview." "I don't think architecture is for the mob. It certainly isn't for education. Education knows nothing of it, and very few architects in the world know anything about it." --Frank Lloyd Wright to Wallace, Sept. 1, 1957, "The Mike Wallace Interview." "The debate between atheists and Christians is rather stale to me.... It's as difficult to get charity out of piety as it is to get reasonableness out of rationalism." --Reinhold Niebuhr to Wallace, April 27, 1958, "The Mike Wallace Interview." "The people who emerge in leadership positions in this country usually come from a lifetime of experience which doesn't prepare them for the conduct of foreign policy." --Henry Kissinger to Wallace, July 13, 1958, "The Mike Wallace Interview." "That's a question [i.e., segregation] of where every amateur is an expert and where experience counts for naught. We've worked out a system that is harmonious." --Sen. James Eastland to Wallace, July 28, 1957, "The Mike Wallace Interview." "The prices in the automotive industry have nothing to do with the law of supply and demand." --Walter Reuther to Wallace, Jan. 25, 1958, "The Mike Wallace Interview." "Every oil man, every radio commentator, everybody who works sells out, usually sell out more than their minds – they sell out their souls, their character, their point of view and they sell out in other different forms – what their neighbors are thinking. They usually throw in the sponge when they’re about twenty-two or twenty-three and they quit, they become echoes, they echo each other. They’re terrified of making any odd remark, even at the dinner table. The American has become in my time, one of the most ironed out human beings I’ve ever seen. Sort of an imitation Russian today. They can’t think for themselves, speak for themselves – terrified of saying he doesn’t like My Fair Lady – terrified at making any crack against anything successful or popular." --Ben Hecht to Wallace, Feb. 15, 1958, "The Mike Wallace Interview." 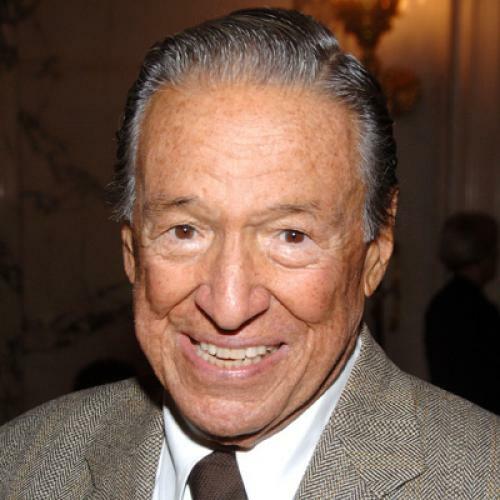 People are commemorating Mike Wallace's death at 93 by quoting his entertainingly rude questions. But unlike many askers of rude questions, Wallace often got pretty interesting answers, especially early in his career, before famous people learned to be careful about what they said on television. The University of Texas' Harry Ransom Center has an archive of many of these early interviews from The Mike Wallace Interview, a TV program Wallace hosted from 1957 to 1960. In between retrospectively hilarious and appalling pitches for various cigarette brands (an insinuating swirl of tobacco smoke rising incessantly from his right hand), Wallace peppered his guests with wonderfully blunt (but seldom discourteous) questions. The clips are a reminder that television was in many ways more interesting when it was "primitive" than after it "matured." Wallace, to his credit, retained a fairly "primitive" style for the remainder of his career, and though he could occasionally be faulted for theatricality, he never lost his bluntness (except with Ronald Reagan, perhaps because Reagan's wife Nancy was an old Wallace friend). But the world surrounding Wallace grew more careful, and it got harder to get celebrities to say anything interesting. At the same time, America's concept of celebrity shrank to include only show business figures. People exerting genuine influence over America's political and intellectual life got relegated to PBS, C-Span, and National Public Radio. Big-time commercial television with any pretense to higher purpose predeceased Wallace; prestige became a luxury the networks could no longer afford. May both rest in peace. Update, 12:10 p.m.: I've added a few additional quotes and subbed in an alternative (more interesting) quote from Reuther.